Rainbow Reservoir’s premium quality water storage tanks. RAINBOW RESERVOIRS continues to be recognised as a preferred supplier to the Concentrated Solar Power (CSP) sector in South Africa, the way forward for power generation in the face of dwindling natural resources required for our ever-increasing demand for energy. Solar energy, like all other renewable energies, is very safe and environmentally friendly. There are no emissions as the source of fuel is the sun, unlike coal-powered stations. South Africa’s Integrated Resource program aims to increase the country’s power generation capacity to 87GW by 2030. The DoE alone has identified 28 solar power generation projects for completion before then. Power generation, water management, agriculture and mining are the backbone within any country, for stability and sustained economic growth. 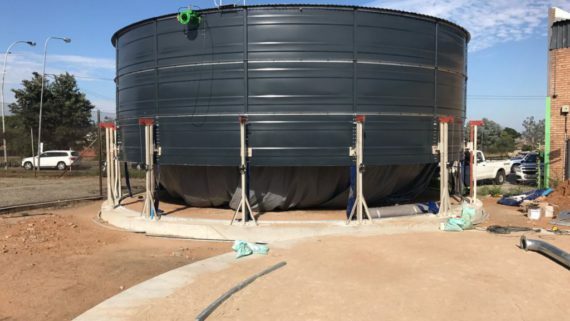 Rainbow Reservoir’s premium quality water storage tanks continue to play a pivotal role within all these essential sectors… and more. And with its recent track record of successful installations in the desalination and renewable energy sectors, Rainbow Reservoirs remains a preferred solutions-vendor not only within the development of our national infrastructure but also within the ever-increasing water and energy challenges so prevalent globally. Gained value from this article? Feel free to share it.